A famous holiday resort, Sorrento stands on a terrace rising steeply above the sea, on one of the most spectacular points of the Peninsula. Its position and mild climate, sheltered by the surrounding hills, have made Sorrento a favourite holiday resort since Roman times. However it was from the Eighteenth Century that it started to become known as an elite tourist resort, its hotels welcoming such poets and musicians as Ibsen, Wagner and Nietzche and in more recent years such Hollywood greats as Sophia Loren, Bridget Bardot and Grace Kelly. 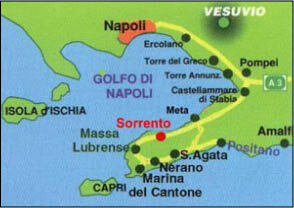 Its high position above the sea and the absence of a true sea promenade help to create Sorrento’s unique character. In fact, Sorrento boasts 2 harbours, the Marina Grande and the Marina Piccola, both offering picturesque bays, sandy beaches and panoramic views of incomparable beauty. In contrast, the surrounding hills are covered in an assortment of olive-groves and citrus fruit trees. 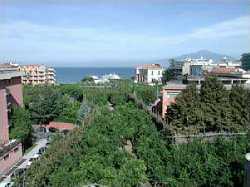 The apartments are situated on the fifth floor of an elegant building on the High Street (Corso Italia) in Sorrento town center, with access via elevator (lift) and stairs. 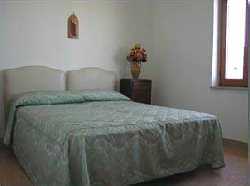 Recommended for families or couples who are looking for a comfortable and convenient, central location. Free entry to a hotel pool (five minutes walking distance from the apartments). Please Note: Cars are not recommended. Sleeps 2/4 with sea view. Apartment (84 square feet) has three balconies with sea views, two bedrooms both with double beds or two single beds (available on request), living room, large kitchen with Vietri’s tiles and bathroom with shower. 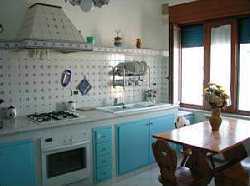 Facilities: TV, washing machine, refrigerator, oven, heating available in winter time on request (Euro 100 per week), hairdryer and ironing facilities. Sleeps 2/5. Apartment (84 square feet) has two bedrooms both with double beds or two single beds (available on request), living room, kitchen, large bathroom with bath and shower. Facilities: TV, washing machine, refrigerator, oven, heating available in winter time on request (Euro 100 per week), hairdryer and ironing facilities. 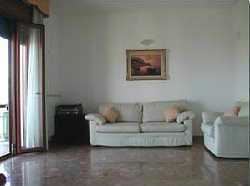 A 30% deposit of the rate agreed is required, when the reservation is done. On your arrival, you will be asked by the Property Manager for a deposit of Euro 100 for any damages caused during your stay. This deposit will be returned prior to departure, by the Property Manager, provided no damages have occurred. Three days prior your departure, you will be required to settle your bill in cash or traveller cheques. Please Note: Credit Cards cannot be accepted.